San Diego - January 9, 2018 - Advanced Test Equipment Rentals (ATEC), the premier provider of test equipment rentals, now offers for rent the EMC Partner DOW3000, which is electronic measuring equipment for energy distribution networks. ATEC offers an extensive inventory of products from top manufacturers, like EMC Partner, flexible rental options, and affordable prices. ATEC sets the industry standard for test equipment rentals, combined with next-day shipping and knowledgeable rental agents. ATEC simplifies testing and helps clients complete their projects sooner. The EMC Partner DOW3000 is the latest development from EMC Partner. It is a configurable high voltage test system that can be extended for slow and fast damped oscillatory waves, impulse voltage test, or any combination of the three options. The integrated 32 amp three phase coupler (CDN) has a CDN rate of 690 Vac and 500 Vdc and enables both slow and fast DOW signals to be directly injected into the device under test. Additionally, the DOW3000 is the first tester with integrated 0.5J impulse, required with the DOW, for product standard testing. 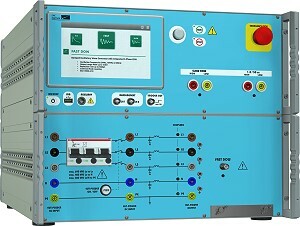 The EMC Partner DOW3000 meets test standards IEC 61000-4-18, IEC 61000-4-10, and ANSI C37.90.1. "We're really excited to bring the EMC Partner DOW3000 on board because it gives test labs and manufacturers the ability to test these oscillatory wave standards in a small and modern integrated package," said Gabe Alcala, Business Development Manager at ATEC.